Only the faithful four turned up on a breezy day when the wind strength was strong in the gusts with the 6M,s just being able to cope. We had some good racing with the boats close together and making a fine sight, almost on the plane running before the wind at times. Racing was very close with Jim perhaps being the most successful skipper, but he was hard pressed by the others. We started racing late and so did not get too many races in (5) but the first, second and third in each race were (1) Jim, Alan, Derek. (2) Derek, Alan, Ted. (3) Jim, Ted, Derek. (4) Derek, Ted, Jim. (5) Jim, Derek, Ted. As can be seen, the racing was very close in the brisk winds, the boats themselves being in close company much of the time. A good days sailing. Next scheduled meeting is on the 3rd August when we shall be sailing the 1M,s and expecting much from Alan with his new boat. Derek. SOLING NATIONALS at Clapham on the 13th July. A great day at Clapham with a greater number of entries than there were at the first meeting last year, which pleased everone. The Clapham Club fielded the largest number of entries with others coming from Guildford, Gosport and Bourneville. Mark Dicks, the defending Champion from the Clapham Club was there, as also was Graham Reeves who started the Soling off in the UK. The weather was fair and warm with a good breeze which came and went at times, but conditions I suppose were almost ideal. Rob Vice, the OOD, started the racing soon after 11am after a briefing session detailing the course, and a few words on what he expected from the skippers. It was to be serious racing, but also a fun day for everyone and he did not expect to hear protests. All went well in the spirit of the thing and under Rob,s calm and assured guidance the meeting proceeded smoothly. The format was to have two races, then a short break for tuning and adjustment and then two more races and so on. We broke for lunch at about 1-1.30pm and then continued till 4pm. Several entrants had minor problems at times with exhausted batteries and such things, although one entrant had a terminal problem when his rudder fell off and was lost in the pond. In all, twelve boats were registered to race and most of them completed the day. This was an improvement in entries over last years total of eight and pleased Graham Reeves very much. The winner on the day was Mark Dicks from Clapham, who retained his title from last year. Second came Phil Broszek from the Guildford Club who was only one point behind the winner, and sailing a borrowed boat at that. A great performance. Third came Clapham,s Jim Robinson and fourth was Graham Snook also from Clapham. Fifth was Jim Vice, sailing Allen Scarlett,s boat and from Clapham also, so making the top four places out of the first five going to the home club. A great effort. 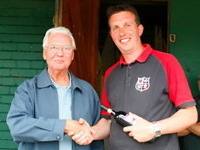 Prizes for the event were donated by Graham Reeves and were presented by the Chairman of the Club. A handsome Cup to the winner and a bottle of wine, and a bottle of wine to the second, third and fourth place skippers. All in all a great day. Run faultlessly by our OOD, Rob Vice, with help from Jim Vice and Phil, although there was so little left for them to do that they were able to borrow boats and compete, to great effect in Phil,s case. Many of us will look forward to next years meeting, wherever that might be held. The next normal Club meeting will be on the 20th July when we will be sailing the 6M,s. See you all then. Derek. A very breezy day with some light rain, not the best of sailing weather. We would normally be sailing the 1Metre,s but in view of the SOLING Nationals to be sailed on the pond next week, 13th July, we took the opportunity to have a trial run with the SOLING,s. Rob, Jim V and Phil came along to check out the equipment and the buoys and to have a rehersal for the event. Jim R, Ted, Justin, Alan, John, Hugh, Graham and Derek came along to sail. With Jim V and Phil also joining in the pond looked quite crowded and a good test of what it might be like next Sunday. We did not get a great many races in as some members had to leave early for one thing and there were several gear failures for one reason or another in the strong winds, but it did show that we have got everthing in place to make the event a success. It now seems that we may not be getting as many entries from “up north” as we had anticipated and that the entries from Clapham could well equal those from other Clubs and so with a bit of luck the 2008 SOLING National Champion could again come from our Club. Rob as OOD controlled the racing and kept the scores, which are listed below. It must be noticed that the first three places went to those sailing 1 Metre,s, either because the skipper did not own a SOLING or, as in Jim R,s case, because they did not want to hazard the boat in the gusty conditions. Of the 1 Metre,s, Hugh came first with Phil and Jim R coming second and third respectively. Of the SOLING,s, Jim V came first with Ted second then Graham; whoever was sailing No51; Derek; a white boat only bearing a SOLING logo; then Justin. What the results do show is that it is imperitive to have a sail number displayed, and that on the day skippers must register with the OOD with their name and sail number. The new radio frequency board proved a success. It shows every current 27Mz colour and every current 40Mz frequency, with both UK and EUR numbers. All we ask is that the pegs are returned to the board when a skipper has finished racing. A good, if brief and boistrous, mornings sailing. Let us pray for a fine day next Sunday with a steady breeze. Derek.